I realize you probably don’t have much use for this post today unless you’re one of those parents who’s convinced their kids that Christmas is actually on January 25th. 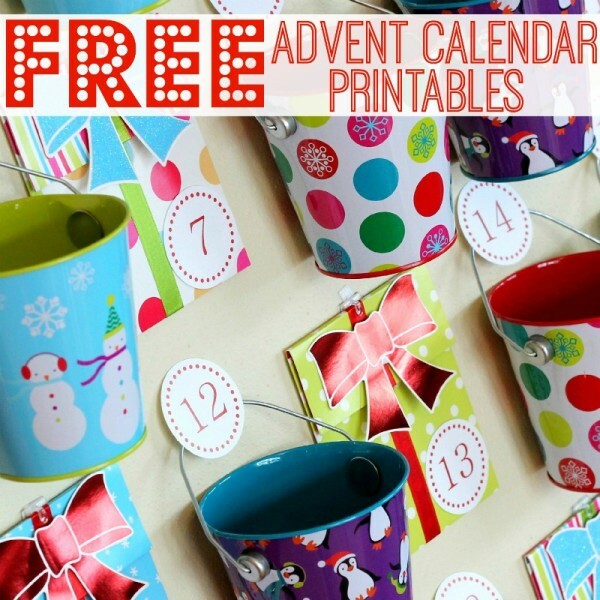 If you fall in the camp of celebrating Christmas on December 25th and you like to amp your kiddos up for 25 days before the highlight of their year, then pin or bookmark this post and come back to it about 300 days from now because let me tell you – advent calendars are FUN! I made our very first advent calendar for our 3-year-old daughter Kate this past Christmas and it was such a thrill to see her excitement each morning to wake up, come down the stairs, and see what her surprise would be! 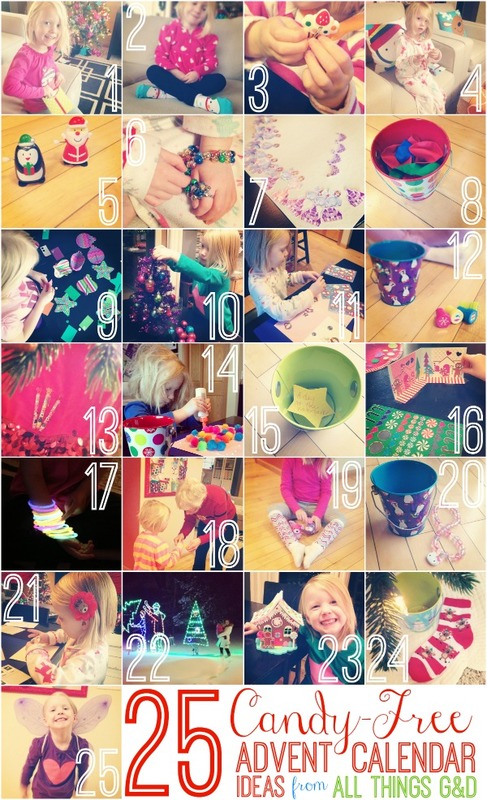 The DIY Advent Calendar I made for our daughter Kate. 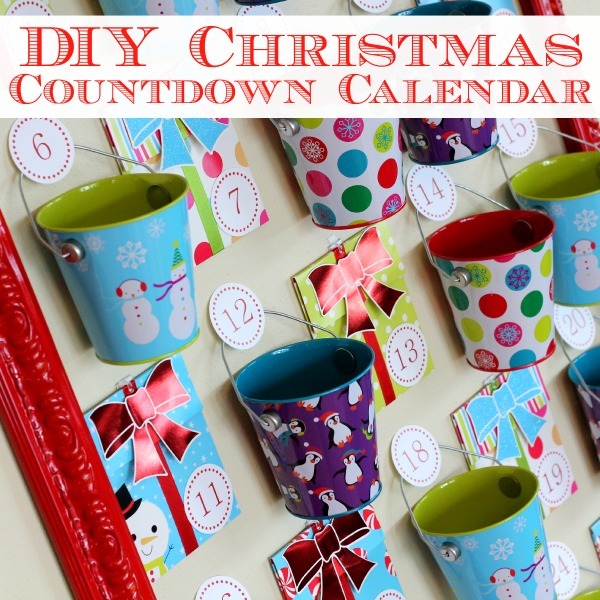 I’m one of those mean moms who doesn’t think her kid should have a chunk of chocolate before her morning oatmeal, and I knew there was no way of talking her into waiting until later in the day to see what her daily surprise would be, so I decided to make Kate’s Christmas Countdown Calendar candy-free. I’ve been collecting little toys, trinkets, and stickers for the past few months from places like the Dollar Store, Target’s Dollar Spot, JoAnn Crafts and Michaels. We also added some fun family activities as well! Day 1: Kate’s a sticker fanatic – a fun fact I capitalized on during the 25 days leading up to Christmas, starting with Day 1 when her surprise was puppy stickers. She couldn’t wait to get her hands on construction paper to make a picture! Day 2: Kate also loves socks with cute designs or characters on them so her Day 2 surprise was snowman socks. Day 3: A cute little cupcake key chain for her backpack. Day 4: Her Day 4 card had a note in it that said, “Look behind the reindeer pillow” where Christmas window clings were waiting for her. Day 5: Holiday wind-up toys. Day 6: Jingle bell jewelry. Day 7: Sophia the First stickers. Day 9: A build-your-own ornament kit. Kate loved putting her new creations on her Christmas tree! Day 10: A table top tinsel tree for our Christmas tree loving (and purple loving) girl. Day 13: Minnie Mouse gel pens. Day 14: A bucket of colorful pom-poms for a fun craft project. Day 15: The note in her bucket said, “A day at the waterpark!” G took her to a little local indoor waterpark and the two of them had a blast! Day 16: A gingerbread house sticker pop up. Day 17: Glow bracelets – another Kate favorite! Day 18: On this day Grandma Pam surprised Kate with a trip to see a local holiday-themed model train show! Day 19: Kate had been asking me for “leg hatches” for weeks. “What are leg hatches?” I asked. “Things that go on your legs to keep them warm,” she explained. Day 19: Leg hatches. Day 20: Hello Kitty necklace. Day 21: A reindeer barrette – the perfect compliment to her reindeer pajamas and reindeer stamps. Day 22: A family night at our city’s Holiday in Lights display. Day 23: A foam gingerbread cottage kit. No icing required. I hope you’re all recovered from the Christmas holiday – just in time to focus on recovering from the New Year’s Eve one! Happy New Year, everyone! That is adorable! 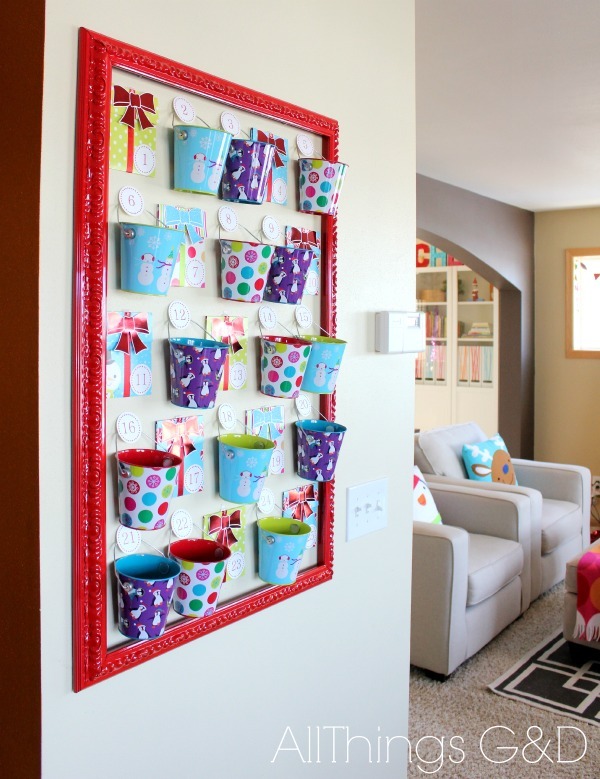 Such a great idea — my little man is 2.5, and I also avoided the Advent calendar because a 7 AM sugar hit was obviously a bad idea, so these alternatives are great inspiration! Thanks for posting about them. Thank you so much! 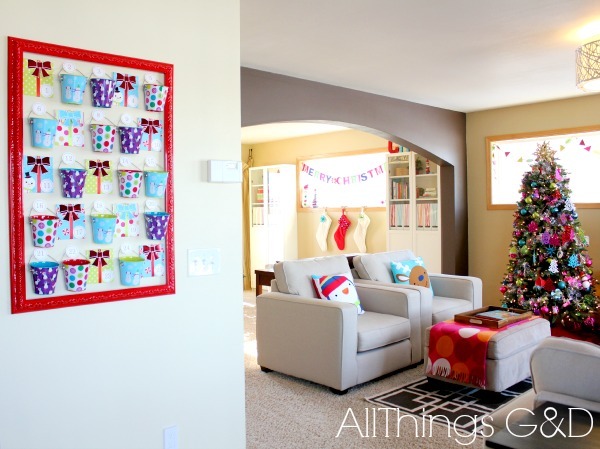 I hope your little guy enjoys his advent calendar next Christmas!